There is no other tournament like it. Here we speak to those who’ve experienced it up close and personal, writes MICHAEL VLISMAS in Compleat Golfer. 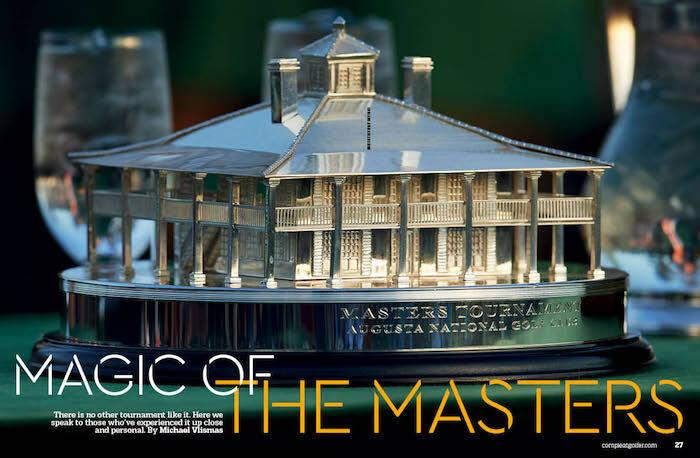 Ask most professional golfers what the one Major they want to win is, and they will answer ‘The Masters’. Coetzee’s jokes aside, The Masters captivates the pros as much as it does the fans. In some cases, it even intimidates them. It’s not too far a stretch to imagine The Masters and the Augusta National Golf Club that annually hosts it as the most intimidating of all the Majors for the pros. In other cases, the sheer weight of having achieved a lifelong dream of winning The Masters can see a golfer slip into the depths of a lengthy slump where he stares into a chasm of ‘What now?’ questions in his mind. The four Majors are already a significant step up in the pressure stakes for the professional golfers. ‘If you believe there is pressure in winning an ordinary Tour event, it is nothing compared with trying to win a Major,’ says Gary Player. And yet The Masters has somehow managed to take this a step further. When it comes to white-knuckle golf, it is where a pro could grip the club so tightly he may even draw blood. As golf fans get giddy about the arrival of the first Major of the year, the weight of expectation that comes with it can drive a star like Rory McIlroy insane. He is known to hate the traditional countdown to the event. You know the one – ‘It’s 90 days until The Masters’. In 2015, Branden Grace had his best year at the Majors to date. He finished tie-fourth at the US Open, third at The PGA Championship and tie-20th at The Open Championship. And he missed the cut at The Masters. ‘I think I just wanted it too much,’ he said. Richard Sterne has made three appearances at The Masters, finishing T25 twice and missing the cut once. ‘I knew the course backwards before I even got there,’ he says. Ernie Els has wanted it as much as anybody for as long as he can remember. His best chances at The Masters came between 2000 to 2004. During this stretch he finished no worse than tie-sixth at Augusta National, including twice finishing as runner-up. Els owns a collection of Masters memorabilia. ‘We have a cupboard-load of crystalware like glasses, bowls and vases, including one for a hole-in-one at the Par 3 Contest,’ he says. Wanting it so badly can perhaps be equated to becoming world No 1, which comes with similar pressure and constraints on time. Perhaps nobody has articulated this better than Martin Kaymer. ‘You get offered a lot of nice things that you always wanted to do in your life, or that you were dreaming of when you were young. Then, all of a sudden you have the opportunity to do all of it, and you say, “Why not?” But then you lose a lot of time for practice and your private life,’ Kaymer said of his experience at the top of the World Ranking. 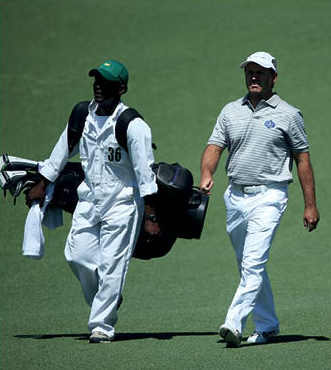 Trevor Immelman had a similar experience after winning the 2008 Masters. For Charl Schwartzel, the pressure after his 2011 Masters win was mostly internal. Schwartzel produced one of the finest back nines in the history of The Masters to win that year, including birdies on his final four holes. You simply don’t play that kind of golf at that level if you haven’t got the BMT to handle it. But it’s the mental trap that is The Masters. It takes the one thing a golfer wanted to achieve so badly and then, having achieved this, sometimes turns it into his greatest burden. ‘Winning on the European Tour is one thing and I won’t take away from any of my victories. But it’s nothing like trying to win The Masters,’ says Schwartzel. ‘You have to be so in control and so calm. There are so many things going through your head and you can’t let it get to you. You hear all the cheers and you know people are making birdies. The roar that goes through there when someone makes an eagle is amazing. There is no other experience like the roar that goes up at Augusta. to give you the best shot into the green. It’s a very well-thought-out golf course. I had to dig deep because the Sunday of a Masters is like nothing I’ve felt before. It’s unbelievably tough to win this Major. ‘I knew I was good enough to win The Masters, but when it actually happened, there was no one more surprised than me. Suddenly you go from being a European Tour winner to winning the biggest tournament in golf, and the hype around it was massive. ‘For the first bit you’re riding such a wave of confidence because you’re The Masters champion. But when it started going bad I didn’t have the experience to deal with it. You think you can’t be playing this badly because you’ve won the biggest tournament in the world. What’s wrong with you? It spiralled the wrong way, and two years later I didn’t like who I was. Gary Player won three Masters titles, in 1961, 1974 and 1978. He’s also had a further 12 top-10s there. Few in golf have a stronger mind and will than Player. Yet, at the 1962 Masters, it was a different story altogether. ‘I was defending the title I’d won the previous year, beating Arnold Palmer on his home turf. And yet, it was the last place I wanted to be that day,’ says Player. But it is testimony to the immense willpower of Player that with all this turmoil going on inside of him, he still finished second that year. a different element to this. ‘During all tournaments, but especially at the Major championships, players face an immense pressure, whether it’s on the tee box or around the greens. It follows you everywhere. Before, during and after each round every day. Palmer recognised this too. In acknowledging how well Player did to beat him at the 1961 Masters, he paid special tribute to the mental fortitude the South African had to go to sleep on a lead and then have a delay in the final round. ‘Such a wait can be murder on a leader’s psyche,’ he said. The aura of The Masters and the pressure of that place doesn’t seem to ever leave even the greatest golfers in the history of the game. They just seem to get better at dealing with it. In 2012, Player settled down to dinner on the eve of The Masters. It was a significant time at Augusta for him. He had been asked for the first time to join Palmer and Jack Nicklaus as an Honorary Starter. It was a tremendous moment for golf’s global ambassador, and it was recognition of the role he played in making The Masters a truly international showpiece when he became the first ‘overseas’ winner of a Green Jacket in 1961. In 1974, he was still the only foreigner to win and again in 1978. It was as late as 1980 when Seve Ballesteros joined him as the only golfers to wrestle a Green Jacket from the Americans. The author James Patterson was seated at the table as a guest of Player’s. He asked the Black Knight how he was feeling about the honour that awaited him on the 1st tee at Augusta National the following morning. For a man who makes a living from words, Patterson certainly had his ear tuned to what was coming next. Player had only one word for him. But you could’ve written a book from it. Richard Sterne has made three trips to play at The Masters – in 2008, 2009 and 2013. He has twice finished 25th and missed the cut once. Sterne is about as unflappable as they come, but admits the 1st tee at Augusta National does crank up the pressure. ‘The first tee shot there is quite intimidating with all the fans so close,’ he says. But although admitting he does like the golf course, Sterne brings a sober view to the greens that make this layout such a challenge. ‘I think they’ve destroyed that golf course, to be honest. Unless there is rain the guys don’t shoot low scores and there is none of that excitement on the back nine any more. It’s become a slog. ‘I’ve spoken to a number of players who have played 20 or 30 Masters, and they all say the same thing. I believe they’re going to lengthen some of the par fives again this year, and those are the only holes you can really score on. it into a green that ran on 6.9 on the Stimp. Now we’re hitting into greens that run on 13 or 14 on the Stimp. ‘Nobody mentions the improvement in golf course machinery. The greens are drier and faster, the fairways are tighter. The ball spins less. The grooves are gone on the irons. So hitting a 6-iron into a green that runs at seven on the Stimp and a green that runs at 14, you can’t tell me it’s the same thing. ‘In particular, I think they’ve lost the plot on holes 4, 7 and 11. If they change those holes, with greens made for wedges, 9- or 8-irons that’s fine. They’re expecting us to hit 3-irons into the 4th, and even woods on a cold morning. It’s over the top. – This article first appeared in the April issue of Compleat Golfer, now on sale!